Ever since mankind first began building structures out of wood rather than stone, fire has been a part of the learning process. In fact, so common have these infernos been throughout history that nearly every major city in the world has been largely burnt to the ground at one time or another in its history. Some, in fact, have burned repeatedly. 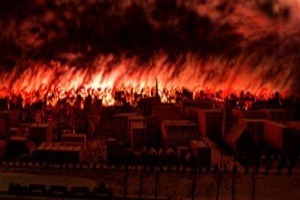 For example, Constantinople was burned no fewer than five times between 406 and 1204 only to be, like a damaged anthill, rebuilt each time, thereby setting the stage for the next great inferno. Many times these fires are man-made results of war, but most of the time nature—combined with poor construction techniques, the extensive use of flammable building materials, and the utter lack of any ability to fight really large blazes—were the culprit. A few of these fires stand out in our memory, however, both for their size and some for having had a major role in shaping historical events. Which fires are these?Without further ado, here is my list of the top ten most destructive, most famous, or most historically significant non-war related infernos in history.